A warm Saturday evening in August deserves an appropriate cocktail: the Gin Rickey. I made two versions; the first was the classic with Plymouth Gin and the second used Earl Grey infused Plymouth Gin. A perfectly clean, crisp, tart, refreshing cocktail that gets you ready for dinner. The Earl Grey infused version has a slightly different flavor profile with deeper, richer nuances with some tannins from the tea. It's like an grown-up tart iced tea. In a iced filled cocktail shaker (or pint glass), add the gin and the juice. Stir for about a minute and strain into an ice filled Collins glass (tall glass). 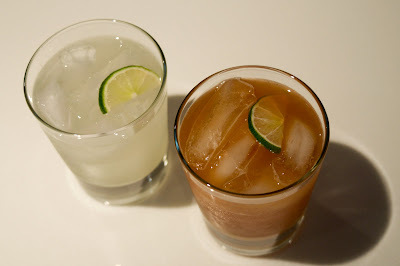 Top with club soda, squeeze a lime slice, and garnish with the slice.